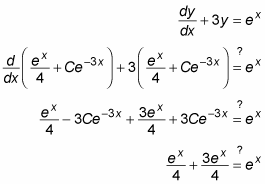 Multiply the DE by this integrating factor. Restate the left side of the equation as a single derivative. Integrate both sides of the equation and solve for y. As if by magic, this answer checks out, so the solution is valid.